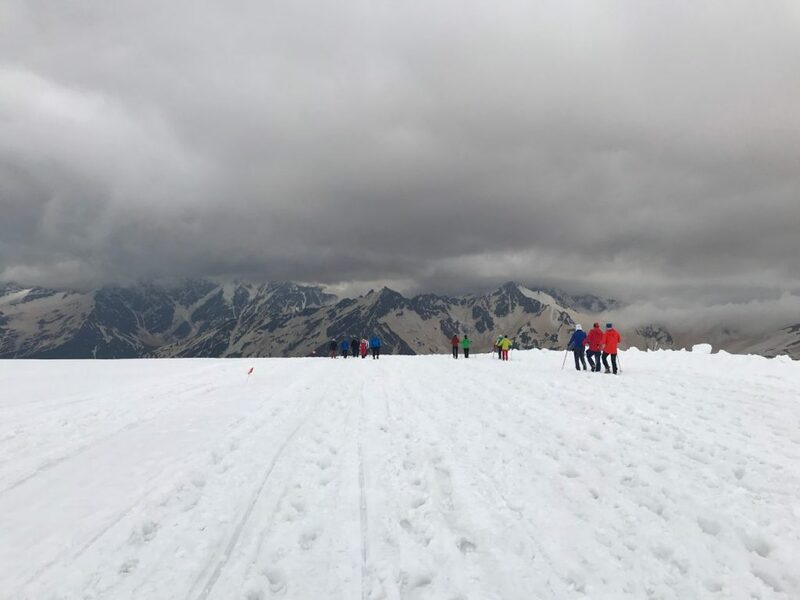 Home › One Step 4Ward Blog › Climbing Mount Elbrus, Europe’s Highest Mountain. Everything You Need to Know. 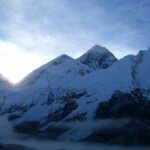 The 7 summits are the 7 highest mountains on each continent, with Mount Everest in Nepal being the highest of the lot (check out what are the 7 summits in my article here). 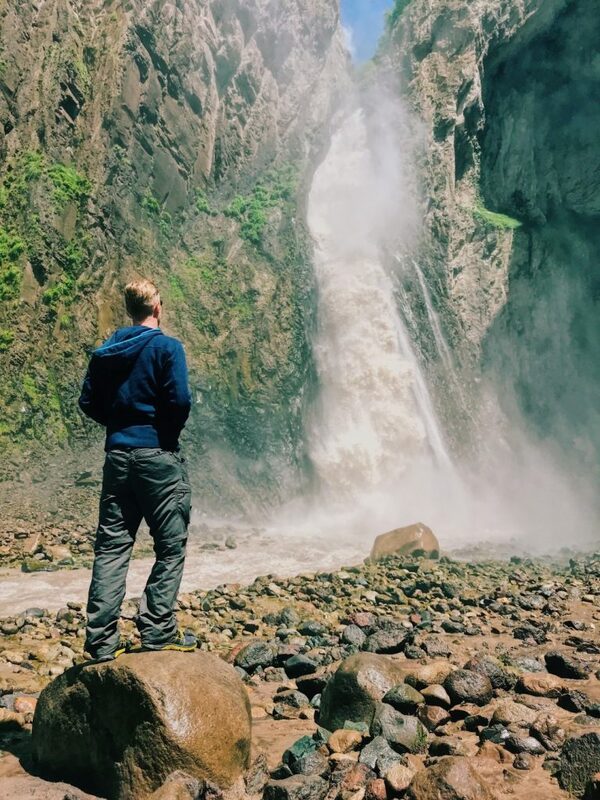 Climbing all 7 is a big goal of many climbers/adventurers, and since finishing my journey to every country, it’s become one of the main focuses of my life. Mount Elbrus, at 5,642m, is Europe’s highest mountain. 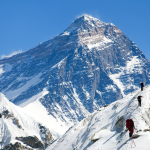 It’s a common question, when asking about people’s personal goals, they ask “What’s your Everest?“, my answer is now Everest! Scary but we need big goals to achieve big things, right? But before Everest, the highest of the 7 summits, I need to take on the other 5 summits. 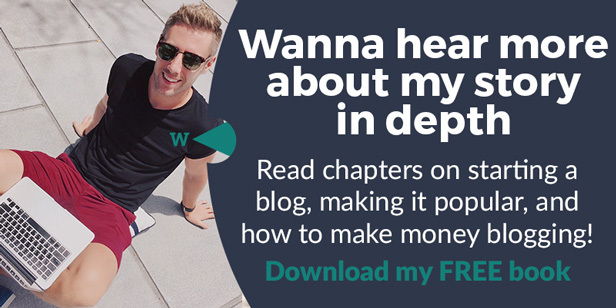 I completed Kilimanjaro, Africa’s highest peak and 1 of the 7 summits, waaaay back during my Cape Town to Cairo trip in 2010, the year I started making money from my blog. So I had 5 left. First up, Europe. So when people ask “what is Europe’s highest mountain?“, a common answer is Mount Blanc in France. I also used to think that, but at 4,810 m, it’s wrong! The highest mountain in Europe is indeed Mount Elbrus in Southern Russia, on the border with Georgia, at 5,642m. So Russia is in Europe? 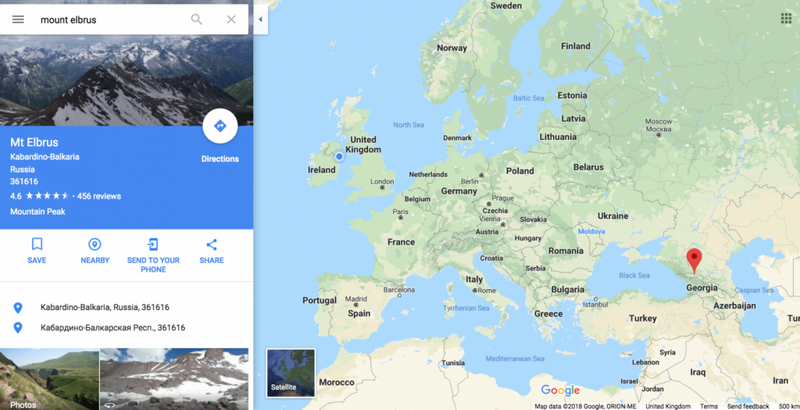 Well that’s a little more complicated, some of Russia is in Europe, but importantly the part of Russia which is home to Mount Elbrus IS in Europe. Most relevant modern authorities define the European continental boundary as the Caucasus watershed, placing Elbrus in Europe due to its position on the north side in Russia. Mount Elbrus waiting for us, Europe’s Highest Mountain. So Mount Elbrus is in Russia, that means first you have to get to Russia. 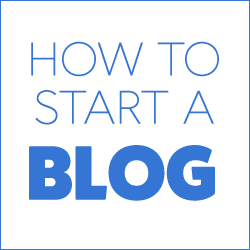 Your first step then is to get a Russian visa. Easier said than done. Generally speaking, most nationalities need to organise a visa in advance, before they come to Russia. And Russia being Russia, you have to do that in your home country. You also need a letter of invitation from a ‘sponsor’ in Russia. Eurrgh headache. The company I used to climb Mount Elbrus was the biggest operator in the region, Mount Elbrus Tours. They were great guides, really cheap, but another part of their package was their help in getting the visa for Russia. After a couple of emails back and forth, they issued me with the official Letter of Invitation, I then printed that out and flew to London (I have both Irish and British passports, I used my UK passport for this one). 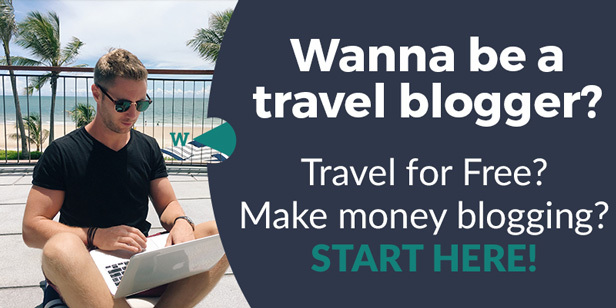 I handed in my Letter of Invitation, filled out the application form, submitted my 2 passport photos, paid the extortionate expedited fee (280GBP ouch – I needed a double entry visa because of onwards trip I had planned, a single entry is fine for you guys! ), and 4 days later my passport was back in the embassy, visa printed and stuck in, I was ready for Russia. 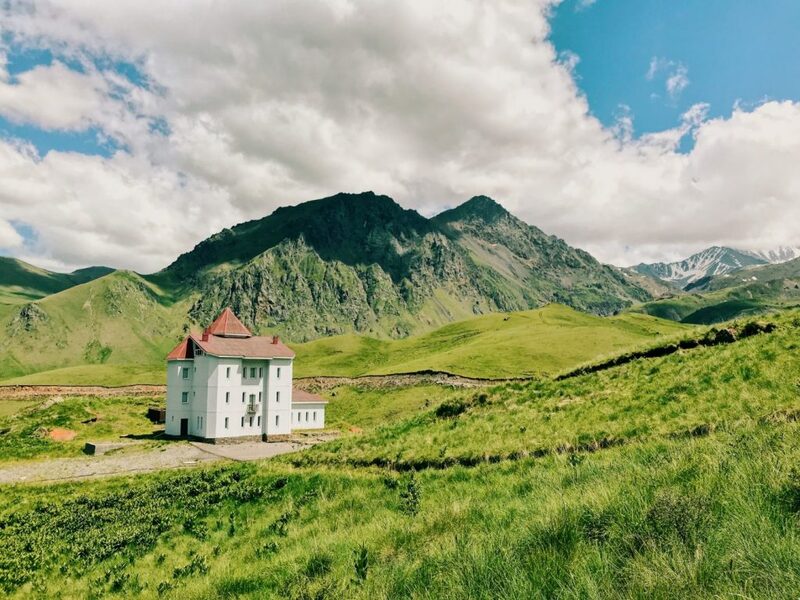 Once you have your Russian visa, getting to Elbrus isn’t so difficult. You have to fly to an airport called Mineralnye Vody, the nearest airport to the mountain. Generally speaking, you’ll fly to Moscow, then connect to Mineralnye Vody. I wanted to be prepped and in good condition for the climb, so I spent a night in Mineralnye Vody (stayed in a quality little place call the Versal Hotel there) and then the Mount Elbrus tour guys picked me up the following day, but your climb organiser can pick you up directly at the airport and bring you straight to the mountain camp. Either way, just get yourself to Mineralyne Vody, and the company will take care of you from there. 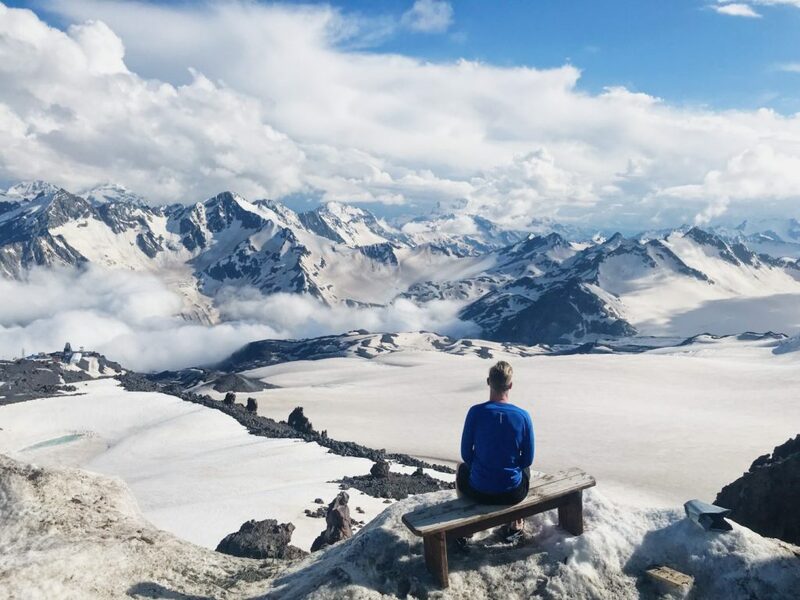 Climbing Mount Elbrus – North Side or South Side? Next up you have to choose which side of Elbrus to climb. I had no idea there was a distinction between the tour, but there is. Basically, the North side is more challenging than the south. The south side is used for skiing, so there are cable cars, hotels, quality mountain huts, even a coffee shop and bar at base camp. You can then, when on the day of the summit, take a snowmobile up to 4,800m, that combined with the cable car up to 3,800m means you’ll have saved a lot of energy and your chances of summiting are much higher! But many call this cheating, that’s up to you to decide. The north side has none of the infrastructure, so you’ll be hiking from base camp, to high camp, to summit all with no help. Much more popular than the North side due to how much more developed the infrastructure is, and the fact that your chance to summit is higher. That being said, it’s often seen as ‘cheating’ on the south side due to the skilifts and snow-cat, more on that later. DAY 1: You get transferred to the town at the foot of Elbrus, Terskol, by your climbing operator. Sleep at the hotel. DAY 2: Acclimitisation hike to 3,000m. Sleep at the hotel. DAY 3: Take the cable car up to 3800m, move to your mountain hut (if you use the same company as me, the mountain hut is gorgeous, restaurant, bar with draft beer etc, but no shower, and outside toilet which is standard up here). Then acclimitisation hike to 4,300m. Sleep in the mountain hut. DAY4: Acclimitisation hike to the Pastuckhov rocks, and beyond to 4,800-5,000m. Sleep in the mountain hut. DAY 5: Acclimitsation day. Some learning of techniques, ropes, crampons, ice axe etc. Quite a relaxed day. Sleep in the mountain hut. DAY 6: SUMMIT DAY! If you take the snowcat (a huge snowmobile) you leave the hut at 3am, it drives you to around 4,800m then you hike to the summit at 5,642. To the summit and back is normally around 10 hours, so you should be up and down by 1pm. If you don’t want to take the snowcat, it’s the same schedule but you leave around midnight, and hike yourself to 4,800m. That’s one for the purests! Sleep in the mountain hut, or if everyone is back before 3pm, take the cable car down and sleep in the hotel. DAY 1: Transfer to Kislovodsk town, sleep in hotelthere. DAY 4: Hike and carry gear to 3800 m high camp. Head back to basecamp and sleep at base camp. DAY 6: Acclimatization hike to the Lenz Rocks (4800 m), sleep at high camp. DAY 7: Acclimatization day, sleep at high camp. 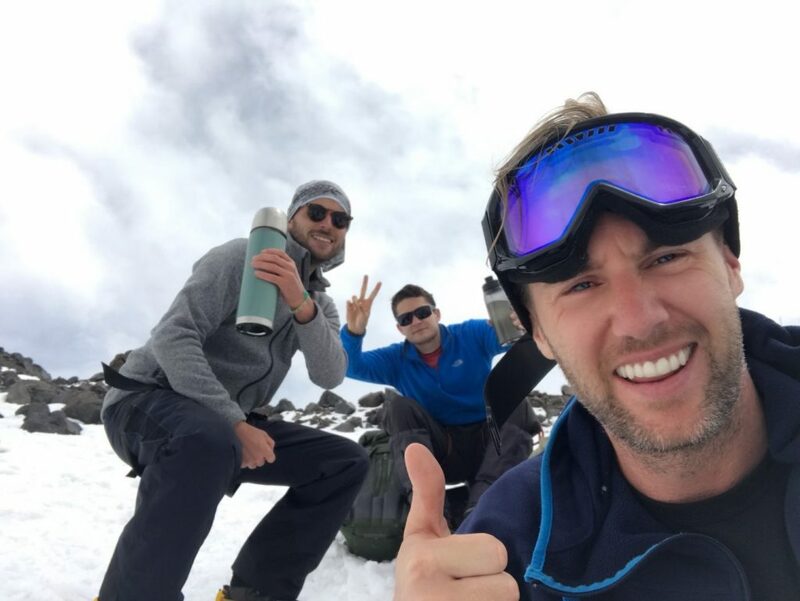 DAY 8: SUMMIT DAY! In the middle of the night, start the hike from 3,800 to 5,642m. 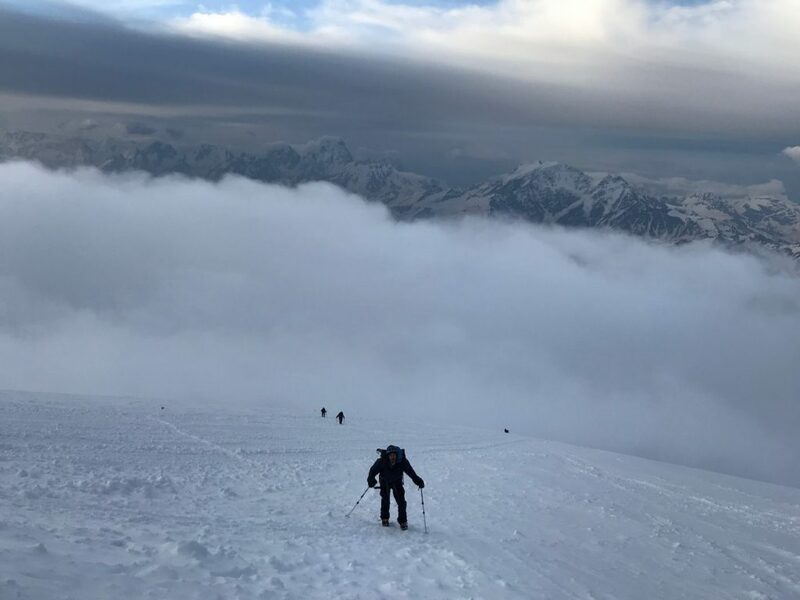 After enjoying the summit and its impressive views of the Caucasus mountain range, we descend back to our High Camp. DAY 9: High camp to base camp. This is also a reserve day in case of bad conditions, giving you a one-day buffer to summit. 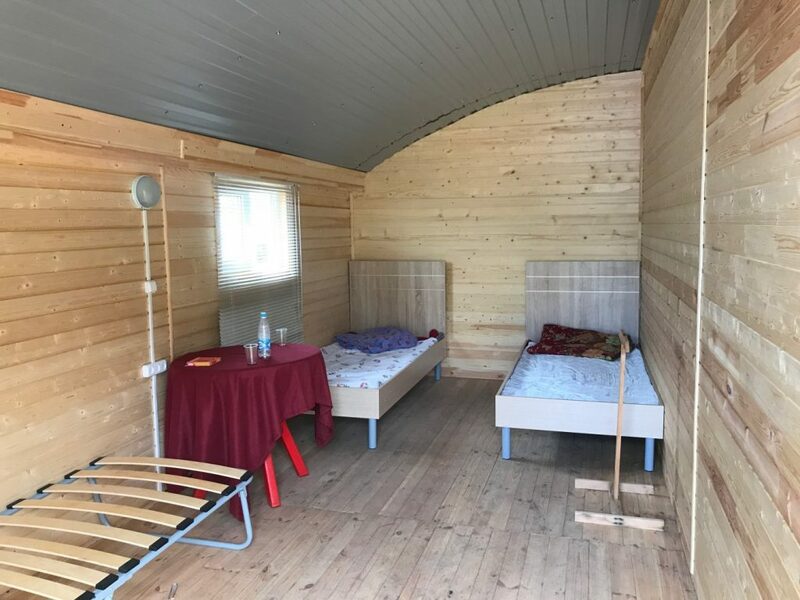 DAY 10: Either departure or a night in Kislovodsk. It’s a gorgeous spa town, highly recommend. Chill, drink beer, celebrate! I had no idea about South Side/North Side at all. I had been in conact with Sergei, the owner of ElbrusTours, his team had helped me so much with my visa and now I was good to go. I told him I wanted the best experience possible, so this was what we worked out. 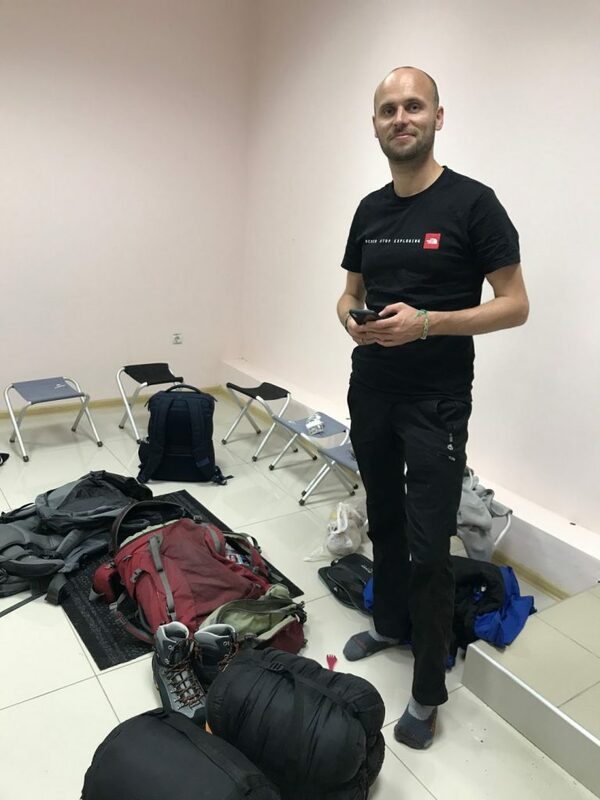 I arrived in Mineralyne Vody with (Anthony from ManVsClock) and we spent a couple of days there catching up with some blogging and business. Soon we meet the Elbrus Tour guys who told us our itinerary. We would drive to the North Side, hike to the base camp, spend a night there, next day we’d hike to high camp on the north side, and come back down to base camp. From there, we’d transfer to base camp on the South Side, in case we weren’t strong enough for the hike without the snowcat on the north side. Arriving at North Side basecamp. Once we arrived at the North side basecamp we had the rest of the day to ourselves, we went for a small walk, and came to the dining hall for dinner where they had great veggie options actually. The following day we hiked to high camp, up to 3,800m. That took us from around 9am until about 3/4pm to get to high camp and back to base camp. Hitting 3,800m certainly felt a lot different from 3,000m too, the air was a lot thinner. Another night in base camp, and if we were staying to summit from the North Side, we’d then head back to high camp the following day, but we transferred to the South side basecamp where we had some friends waiting for us. 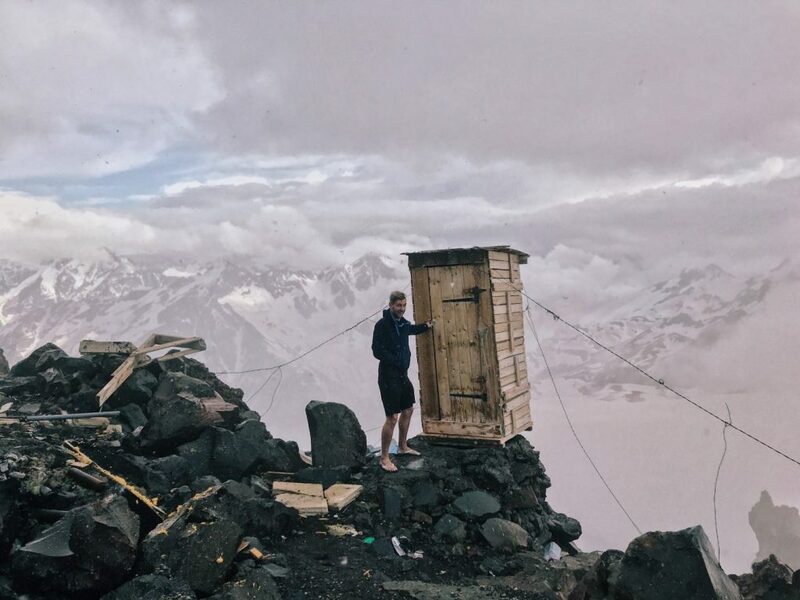 The World’s most dangerous bathroom? 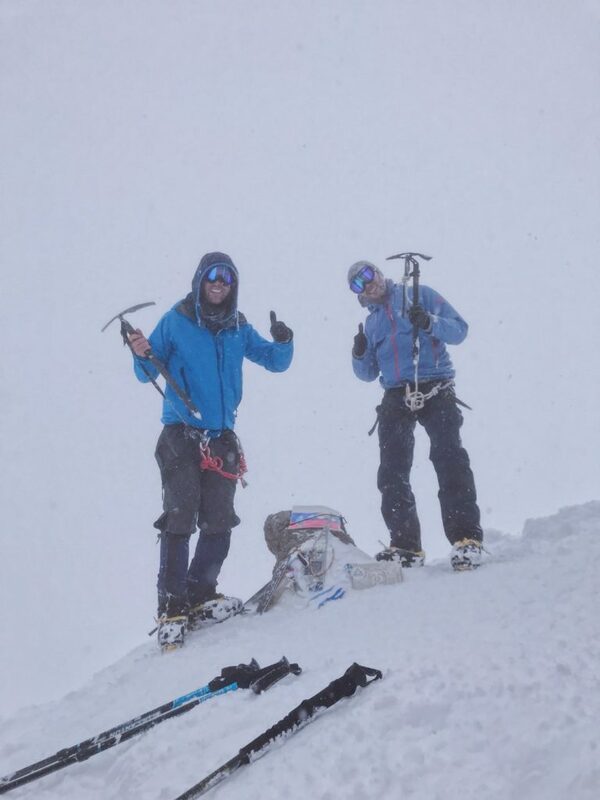 That day we had some ice axe training and a little hike to around 4,000m. Off to bed, then the following day we had an acclimatisation hike up to 4,800m and that’s when you realise it’s not quite the walk in the park you though it’d be! Crampons, walking poles, warm weather gear, hiking through snow and ice, suddenly the oxygen feels thin and you feel out of shape. That hike took us most of the day, up to 4,800m and back down again and a few of the group were struggling already. 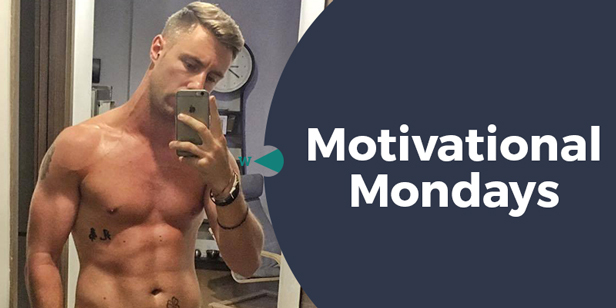 You don’t have to be in marathon running shape for Elbrus, but if you’re completely out of shape, you’ll fail, simple as that. 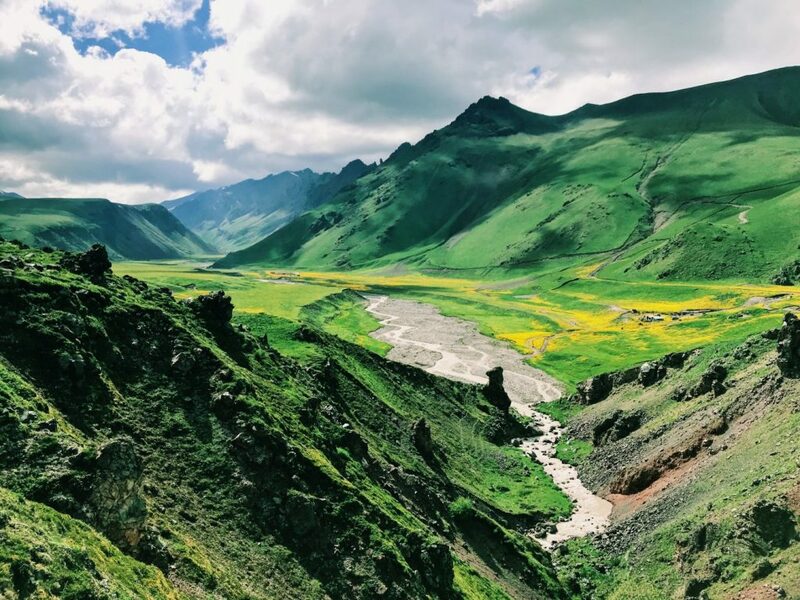 It has a success rate of around 90% on the South Side, so you should be fine, but equally 25 people a year die on Elbrus, so it’s not to be taken lightly. After we got back down, we knew we had the following day as a rest day, to acclimatise further. It was tempting to have some of that draft beer, but thought it better to respect the climb and stuck to coffee. 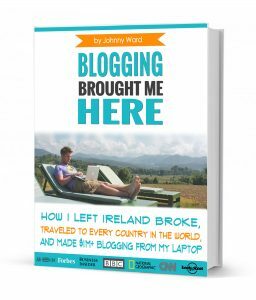 The day off was spent reading books, doing a bit of blogging (they have 4G on the mountain if you have a Russian simcard!) and trying to keep the nerves at bay for the summit. It’s beautiful at basecamp though, so a light walk, take a few photos and a couple of coffees and the day is gone. Time for summit day. The vast majority of people on South Side will take the snowcat en route to summiting, 99%+ in fact. 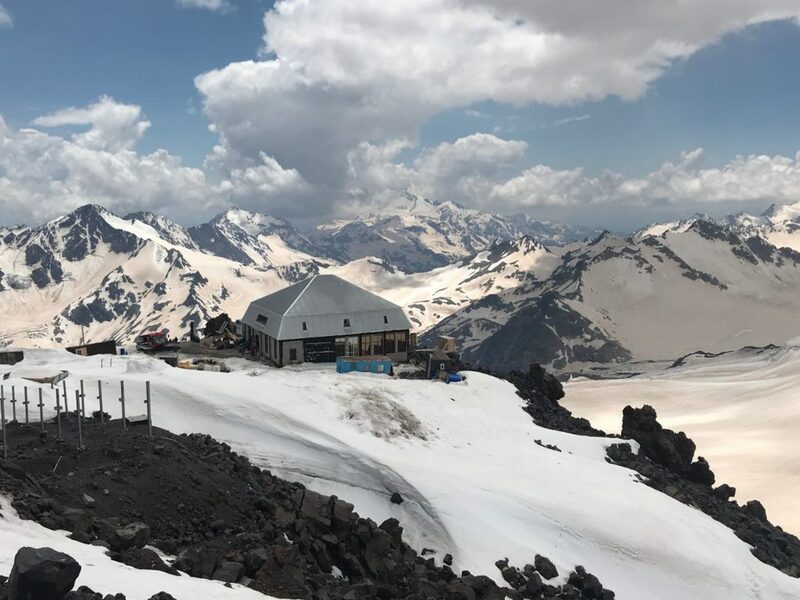 Normally, if people want to truly climb Elbrus and not use any tech, they’ll take the North side, I didn’t know this of course (no research, as usual) so I was stuck on the South side but I didn’t want to take the snow mobile. Kindly, Elbrus Tours stepped in and sent us our own guide for Anthony and I to summit with, the rest of the group would take the snowcat with the original guide. So off to bed that night at 8pm, wake up at 11pm. Midnight departure. We wanted to go from Base Camp at 3,800 to 4,800 by around 4am. The hikers arriving by snowcat would be arriving there from there 3.30am departure sometime around then too. So we got into our routine, Viktor our awesome guide, then me, then Anthony. Straight line, walking in unison. I was still quite fit thanks to running the Marathon at the North Pole 2 months previously, Anthony had come in with very little training but he’s a stubborn guy and that pulled him through the morning, much to his credit. By around breakfast time, 8am or so, we had been hiking 8 hours and had reaching 5,200m or so. The air was getting thinner, the steps were getting harder, and we were breathing a little deeper. We had a few energy snacks in our bag and that helped. The climb from base camp to around 5,200 is pretty consistent in its steepness, but it gets progressively harder as the oxygen levels drop with the altitude. It also gets 1 degree or so colder every 100m too. And of course you’ve already been hiking for hours and hours. Once you reach 5,200m you have a semi-flat section which you walk around, a couple of kms, to the saddle. That’s the low-point between the summit and its sister summit next door. That flat section, you would think, gives you a break but in all honesty you’re quite tired by then and that gentle incline, which takes around 2 hours of hiking, is a killer. Finally you reach the saddle, and you’re only a few hundred metres of altitude from the top. By this stage, you have another 1-2 hours to summit, you’ve been going since midnight and it’s around 8am. Altitude sickness will be affecting you, hopefully just a little, but you’ll know it’s there. I had a bit of a headache and Anthony was starting to slur his words a little. One last push. The weather began to turn, and within 20 minutes there was a full-on blizzard. The last hike to the summit is steep, and there are fixed ropes (the kind of ropes that are ‘locked’ to the mountain by guides, and you clip your harness on to them so you can’t fall), so you take a slow pace. Soon the visibility was about 3m, and we had to rope ourselves together to avoid getting lost. Just one foot in front of another. One step at a time. 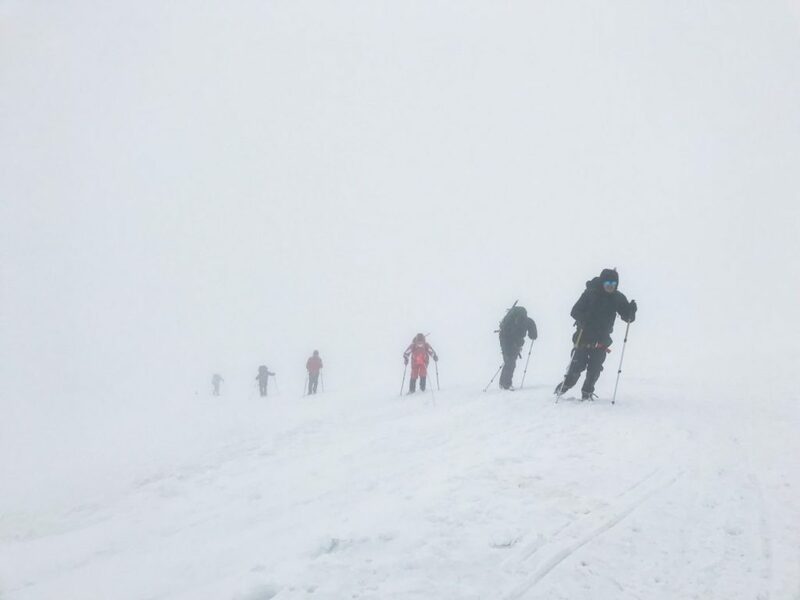 After the final steep section, it’s a 15 minute flat walk to the summit, we knew we would make it, and even through there was no view, and you could barely see your friends, we made it, we summited Europe’s highest peak. Now all we had to worry about was getting back down the mountain! We finally reached the summit at 10am, 10 hours of hiking. The actual distance is only 8km, but it’s almost 2km in altitude too! We spent all of about 5 minutes at the summit, but it was cold, visibility was low so off we went, back down. We picked up the pace, dug into our energy reserves, spurred on by the fact that we knew if we could get down by 14.30pm we could take the cable car to the town, sleep in a real hotel and grab a beer, so off we went. To cut a long, tiring story shorter, we made it back 3 hours or so later, around 13.30. Packed our bags, exhausted (I mean truly exhausted, falling asleep standing up etc), and headed down the cable car. 2/7 summits done. A HUGE thanks to Elbrus Tours for getting us to the top (in fact the entire group summited 10/10 people), to Sergei their amazing owner, to Viktor our superstar guide. Next up, South America’s highest mountain, Aconcagua. December 2018? 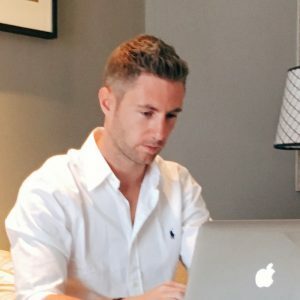 I have a charity project where we’re building a clinic for the Burmese migrants in Thailand starting on December 27th, and I have another school build in Tanzania in September. So 2 months training in Thailand October and Novemeber then off to Argentina? Let’s see! Anyone wanna join?! 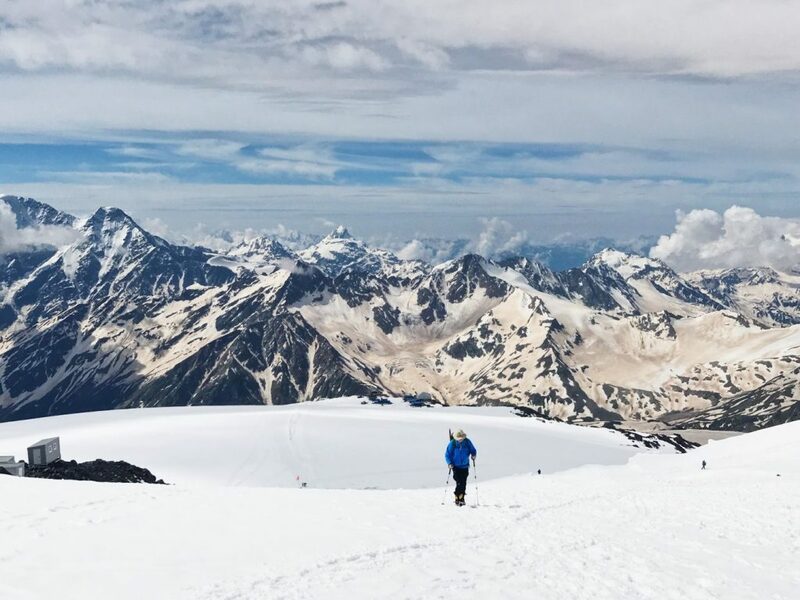 How much does it cost to climb Mount Elbrus? It’s similarly priced to Kilimanjaro, roughly speaking with my guys, it’s around 1000Euro. How high is Mount Elbrus? Look at the map in the article above. It’s in Russia, on the border with Georgia. 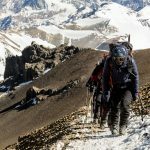 What gear do you need for Mount Elbrus? A lot! 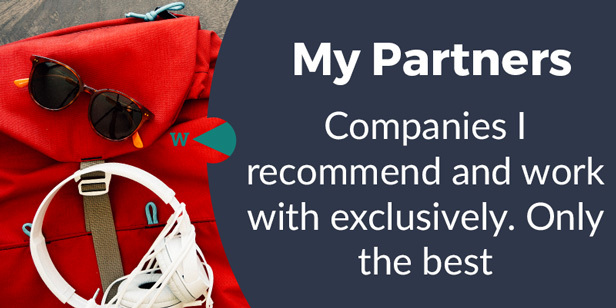 But your tour operator will allow you to rent from them. Allocate a couple of hundred euros for rental and you should be fine. I, for example, brought base layers, ski-pants, warm coat, hat, gloves. Proper climbing boots, crampons etc are all needed too but are available to rent from your guys. 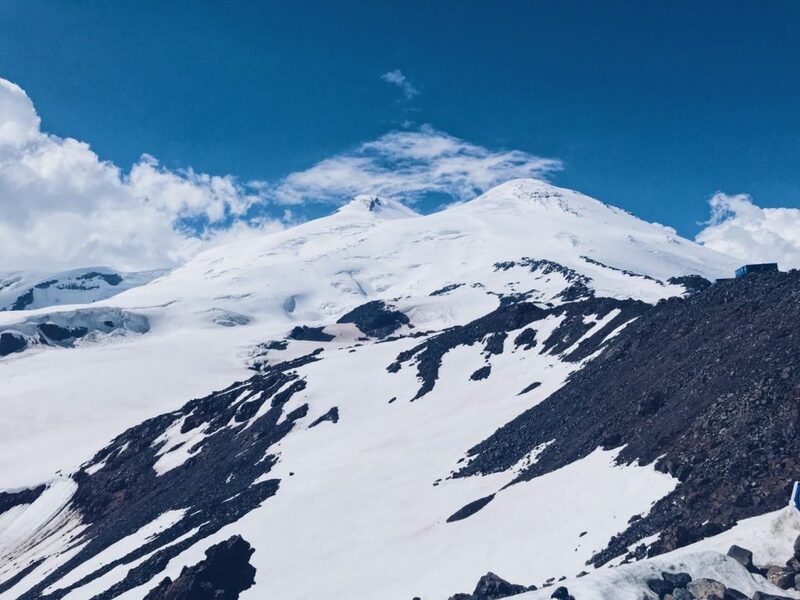 How long does it take to climb Mount Elbrus? Normally from Mineralyne Vody airport, up the mountain, down again and back to Mineralyne Vody airport would be around 8/9 days. If you’re a beast, you could do it in 5 or so. 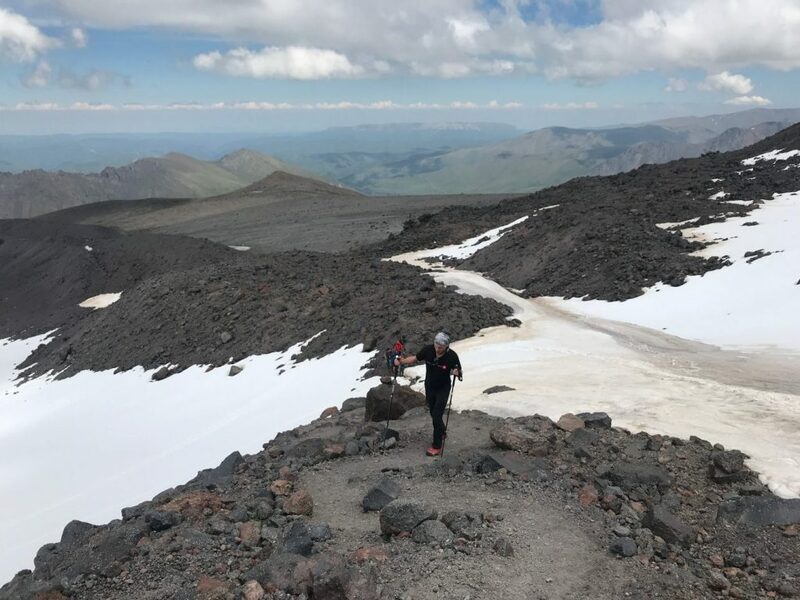 Do I need to be fit for Mount Elbrus? You can’t be unfit, that’s for sure! What people consider fit is difficult to say, I’d say roughly speaking, if you are able to knock out a 10km run in an hour or so, then the South side is possible, Make that under an hour for the North side. That’s a horrific way to look at it, but it gives you an idea to contextulise. 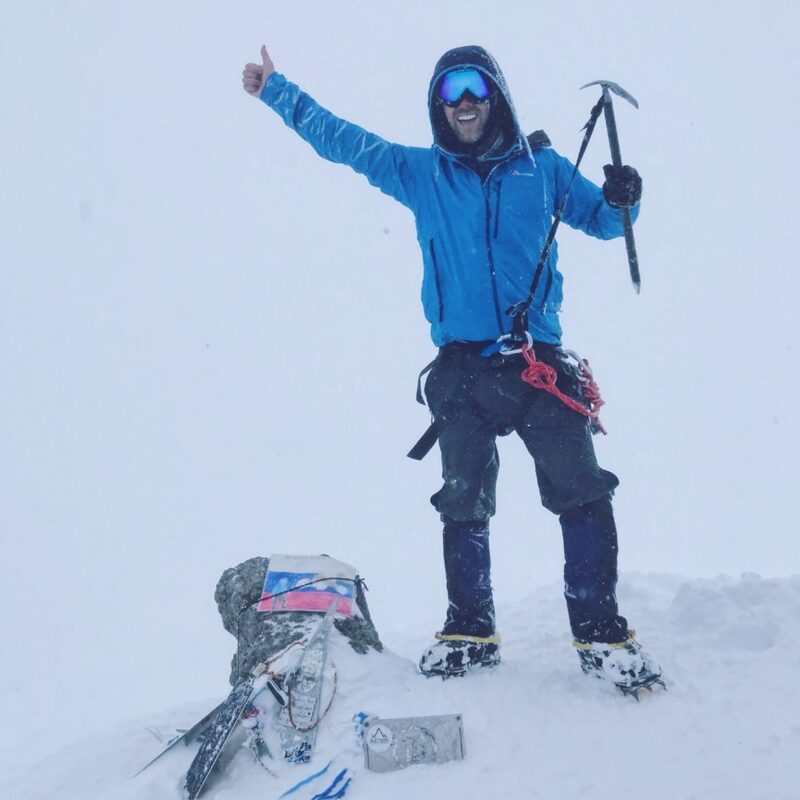 What’s the success rate for Mount Elbrus? What’s the death rate for Mount Elbrus? 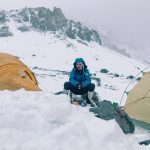 Do I need a guide to climb Mount Elbrus? There is no legal requirement, but for example, when the weather turned at the summit for me, I would have died 100% without a guide. 0 visibility, no idea where to go. Basically, unless you’re a genuine mountaineer, take a guide. What a nice mountain and its scenery ! hola, mi nombre es Rodrigo y soy mexicano! mi pregunta es: ¿Cual seria el primer paso a dar para salir de esta jaula en la que todos estamos? no me interesa el dinero, quiero sentir esa libertad! si es posible irme caminando por todo el mundo no importando si me sangran los pies en el camino. “ya no quiero ser prisionero” ¿algún consejo?